After a long drive from work to the inn I was looking forward to a nice weekend. Check in with Chrissi was smooth and effortless and she informed me of all the amenities available to me. A cheery smile for the start of my weekend. My room was inviting, clean and the air conditioning was running and the temperature was comfortable. I was looking forward to a nice weekend, then I used the microwave. Unfortunately, this caused a problem in my room, I think it may have popped a circuit breaker. I understand that these kinds of things happen and I was not upset. What matters in these instances is what happens next. What happened next was great customer service. A quick call to the front desk to see if anything could be done about this. As it was later in the night the maintenance staff had gone home for the evening. As this had also caused my fridge to stop working and I had stuff that needed to be in there I needed something done about it. Sunni was great at solving my problem, she had a new room for me, got my key card changed and I was in the new room in less than half hour. And my weekend continued on without another hitch. Sleeping was good, comfortable bed and not a whisper of noise from the outside. Waking up refreshed and ready to take on the new day I went to the in hotel restaurant for breakfast. A mix of made to order and buffet style. A fresh made omelet, a bit of sausage from the kitchen and some toast from the buffet. Breakfast was quick and delicious. Off for a day of adventure. Returning to my room after a long day was refreshing. My room was cleaned and the bed made and ready for me for my second night. Another night of quiet, restful sleep followed by a fresh breakfast. Check out was smooth and easy. The option to have my receipt emailed to me and turn in my key card had me out the door and on my ride home in just minutes. Thank you to the staff of the Wallingford/Meridian Hilton Garden Inn for showing me such great customer service. The Wallingford 99 has a very comfortable country feel to its atmosphere. There was no wait for me when I went in for my dinner. I started with a bowl of corn chowder, the soup of the day, when I ordered the waitress suggested that I take the three course meal deal and I decided that was a good idea. The chowder had a nice creamy texture to it with plenty of clams and potato. My main course choice was sirloin steak with fried shrimp combo with fries and a side salad. The steak was cooked perfectly to my taste (med rare), the fries where well cooked and crispy, the shrimp was deep fried and very tasty and the salad was nice and fresh. Quite enjoyable dinner. For dessert I went with the Peanut Butter Brownie Petite Treat (petites are the selection for the meal deal). Decadent is the only word that came to mind while I was eating this delicious treat. A peanut butter brownie topped with a scoop of vanilla ice cream and drizzled with some chocolate syrup, this and a glass of cold milk made for a great ending to a wonderful dinner. What a beautiful day for a short trolley ride. I enjoy trains and trolley rides and learning their histories. The museum building itself is not large but a lot of information and displays are packed into the small space. 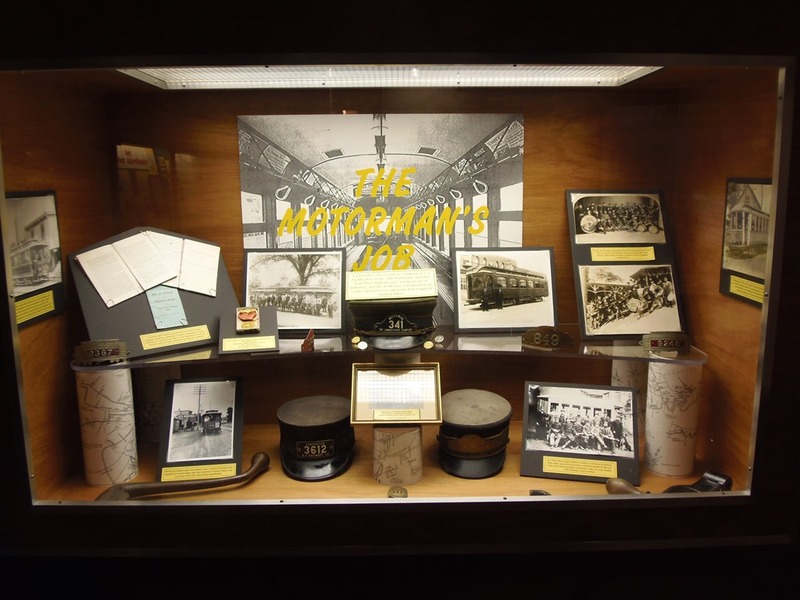 There are a few interactive displays that can be played with as well as plenty of historic articles and paperwork on display as well. There is also a good selection of items at the gift shop. There is also a trolley ride available. The ride takes you through the museums train yard and then through the woods and marsh. The ride is under an hour long. On the way back to the main trolley stop at the museum there is also a stop in the train yard where you get a guided tour of the buildings housing many different trolleys, subway cars and busses. A great walk through the history of public transportation. 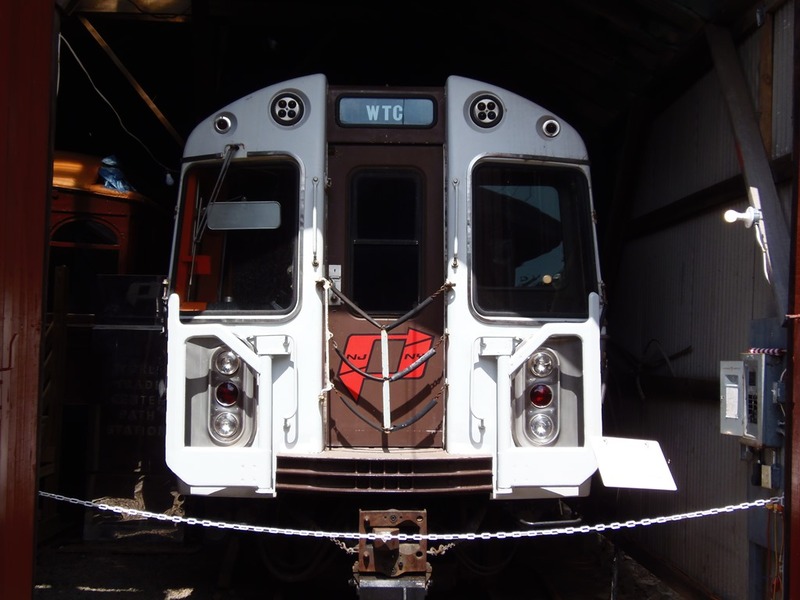 Included in the collection of cars is one of the two subway cars that survived in the World Trade Center garage. A great place to visit if you are into trains or the history of transportation. The ride from the trolley museum to Dinosaur State Park was a little over a half hour. When I left the museum it was a beautiful, sunny day. About half way to the park it started raining, really raining, to the point that I had to slow to a crawl on the highway. On the day of my visit to the Dinosaur State Park the park was celebrating its 50th anniversary. Unfortunately, that day was also sporting heavy rains. A lot of the outside activities where not happening. Fortunately, there is plenty to see on the inside. 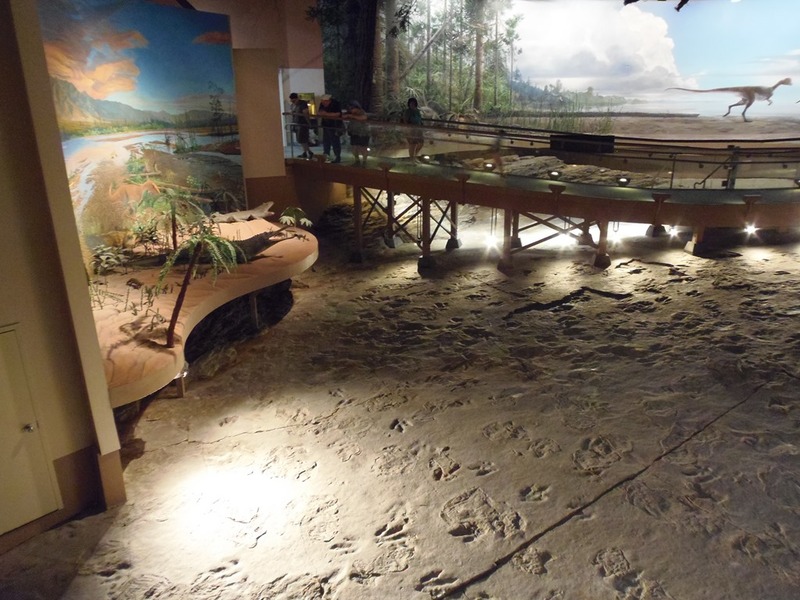 The park itself was created as the result of finding a large area of petrified dinosaur tracks. The main building was constructed over the large area of the petrified lake bed. Around the open area above the tracks are plenty of other prehistoric exhibits, dioramas and displays. There is also a discovery room with loads of hands on stuff for the younger visitors to explore. I enjoyed my visit to the museum, I only wish I could have taken the walk around the outside. I may plan another visit in the future for the purpose walking the grounds. My plans for the evening, get on a conference call with a couple of my friends and watch the final Tragically Hip concert. Take out was my best option, it gave a dinner as well as some finger foods to snack on during the concert. My choices where Crab Rangoon, Beef Teriyaki, Boneless Spare Ribs and Pork Lo Mein. I prefer lo mein over rice personally. The Crab Rangoon where a little bigger than I am used to, the crust was nice and crispy and they were very well filled. They had a very rich flavor and filling. The Beef Teriyaki was. Beef Teriyaki. Nothing more to really say about the Beef Teriyaki. The Boneless Spare Ribs were also a bit bigger than I am used to, they were well sauced and very tender. The Pork Lo Mein had a nice sauce to it that was rich in flavor but not too spicy. The evening plans for me as I said was to watch the Tragically Hip’s final concert. I have a friend in Calgary Canada who got me interested into the band, I do wish that had happened many more years ago as I have found to enjoy the band a great deal. Relaxing in my room with my tablet connected to the television for the show and on Skype with my buddy in Canada made for a very relaxing evening and a very cool last night of the weekend. Sunday morning came after a nice relaxing nights sleep. The drive home was uneventful and under a nice sky.